This is our first year as a Scouting family. With one Boy Scout and one Cub Scout, it has been an interesting experience. We've had a great time learning different skills and spending time with other Scouts and their families. Maybe I should've made myself a hidden camera instead. The fake smiles and real smirks can be a bit discouraging sometimes. I'm glad they can't be on smile-avoiding-duty 24/7. Oh! Thank y'all for giving me your input on which picture to send to Great Grandma. I think it was almost unanimous that the no-teeth picture is the keeper, er sender... you know what I mean. 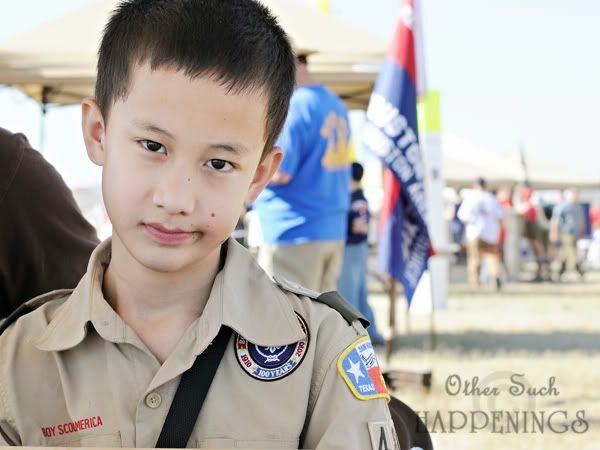 These pictures were taken at SHAC Jam, which stands for Sam Houston Area Council Jamboree, this past Saturday. We drove in for the day, joining over 22,000-- yes, that is twenty two THOUSAND-- other people in a slew of outdoor activities, displays, crafts, and even a world record setting rocket launch! It was fun, but I'm glad it's over. Hot, dusty, and did I mention the whole 22,000 people thing? I am such a pansy when it comes to crowds. So, is your family a part of Scouting? 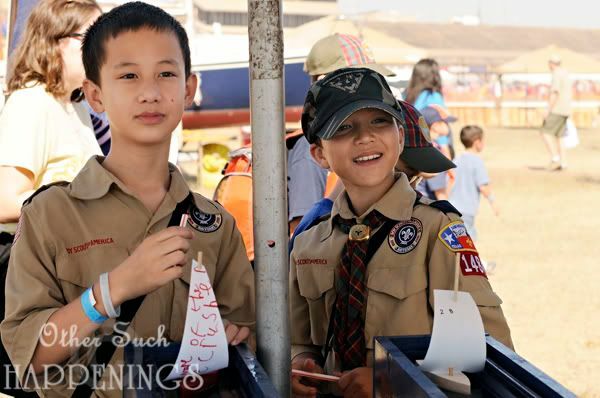 Were you ever a Scout (boy, girl, brownie, cub)? Do you have a cure for the camera smirk? They are sooooooo cute in their uniforms. :) I love it! Noah has that "I'm too cool for pictures" look down. I love the camera smirk. But my cure for the camera cheesy smiles is to have a long lens handy for candid shots. Your boys look like such MEN in their uniforms. Tell them that and I'll bet they'll suddenly stand taller. (It's so cute when they do that, but don't tell them they're "cute," of course, or you'll have that first look again). Those smirks really make me smile. SO cute. Hate that we missed this. Sounds like the boys would have loved it. We'll miss the camp out too. But we're having a blast in Hawaii. Oh my. They DO look adorable! I kinda like the smirks, too. Aww....so sweet! I LOVE Scouts in their uniforms! Alex is a Webelo. He will move up to Boy Scouts in the Spring. We just attended a Push Cart race with the scouts. It was a blast. I am hoping to post pictures on my blog soon. P.S. I haven't had to worry about the "smirk" yet, just because Alex LOVES the camera (for now). Men in uniform sure look dangerous! We spent 13 years active in Boy Scouts and we seem to buy even more popcorn now. I can't turn down those adorable cub scouts with tables outside of the grocery store. I don't tell my kids to smile. I make a funny face or say a funny word to try for real smiles. I'm not too proud to cross my eyes and snort like a pig. Yep, I was a Brownie and later a Girl Scout....And I STILL remember the pledge we had to say with three fingers held up!! Yes, my memory isn't totally fried! The smirks? Love them. I mean, Austin looks like he heard you say how cute he looked!! Did you say that to him?? Sadly, no we are not a scouting family. I haven't been able to find one close enough to us and I am too lazy, er, busy to drive across town. It looks like a lot of fun though. Sorry, no cure in sight here. Definitely stinkin' cute in those uniforms:) We never did scouts but my son could totally rock his karate ghee! I absolutely love the smirks. It shows so much of their personality that most pics won't show. Of course I like the normal smiley one's too (just not the fake "here's mom & the camera again" smile)! your boys are so cute! 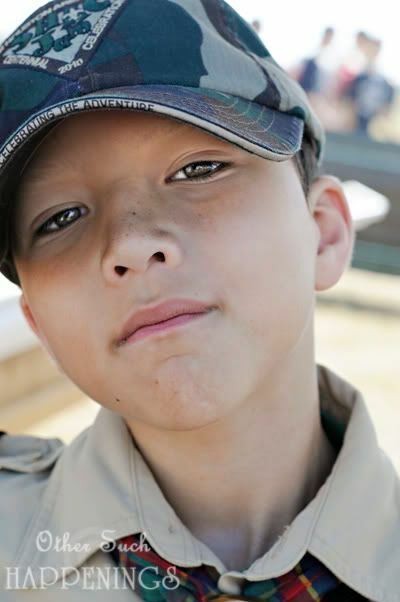 i hope my little man joins scouts one day.